A congressional hearing in Brazil has been told that the governing Workers' Party of President Dilma Rousseff received up to $200 million skimmed from contracts with the state-owned oil company, Petrobras. 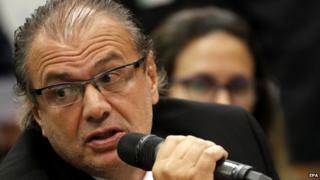 The accusation was made by a former Petrobras executive, Pedro Barusco. He alleged the current treasurer of the Workers' Party had been involved in the scheme. The Workers' Party has said it only received legal donations. President Rousseff, who chaired Petrobras's board for seven years when much of the corruption is alleged to have taken place, has denied any knowledge of it. Mr Barusco, a former executive at Petrobras, who is repeating claims made in plea bargain testimony, had worked in the company's services division. He said he received payments from large engineering and construction companies as long ago as 18 years. In return, the companies received inflated contracts from Petrobras. He accused the Worker's Party treasurer, Joao Vaccari of also benefiting from the payments. Mr Vaccari was questioned last month but was then released. His lawyer and the Workers' party say the party only accepted legal donations. Mr Barusco said he did not know who ran the scheme and to his knowledge the former Petrobras chief officer, Maria das Gracas Silva Foster, who resigned along with other senior Petrobras management last month was not involved. Earlier this week, Brazil's Supreme Court approved the investigation of dozens of politicians for their alleged involvement the Petrobras kickback scheme. Among the 54 people accused of taking bribes are a former president and the speakers of both chambers of Congress. Most politicians under investigation belong to the governing coalition. President Dilma Rousseff has been completely cleared of any involvement in the scheme.